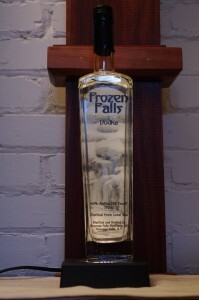 Honeoye Falls Distillery is one of the newer distilleries in the Rochester and Finger Lakes area. Located about 30 minutes south of Rochester it is nestled in the hill and drumlins of the Finger Lakes area and draws its water from the nearby Finger Lakes of Canadice and Hemlock Lakes ( both of whom are water supplies also for the city of Rochester and known for the taste ad purity of their water.They use a second generation ( as I call it as significant improvements have been made over the first models) Artisan Still Works stainless steel steam fired still with a column and copper inserts.They make a unaged rye spirit called Lantern Light Rye Moonshine, A gin called Devils Bathtub Gin, a aged rye by the name of Red Saw Rye and an extremely limited release Bourbon along with this their Frozen Falls Vodka. Notes: The vodka is made from 85% very locally grown rye and 15% of the mash bill is a 6 row malted barley from Pioneer Malting, our local Maltster. 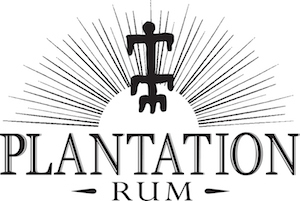 First Impression: Relatively light bouquet of grain with the distinctive, slightly peppery, sweet sour notes of rye with a nice backbone of alcohol that is well-integrated into the bouquet ( read it does not burn your nose or have off notes). Taste: A good slightly oily entry from the grain coats the tongue and is followed by a push of sweet and sour, Szechuan pepper like flavor notes ending with a gentle warming and slightly mineral like fade. Nicely constructed and integrated taste profile , it is not one of those overly sweet and flabby vodkas, but has a nice structure to it. Other: If it was a couple of dollars less it would have had a 9 in the value/price rating. 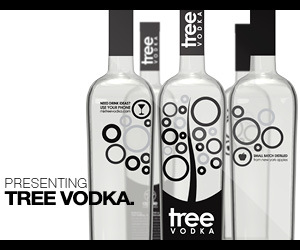 Final Thoughts: A well made rye based vodka that is made from local New York State ingredients. I would stack it up against virtually every other rye vodka I can think of in terms of quality, and it is even cheaper than many of the big boys vodkas. A well laid out and fast loading site with easy navigation and a fair amount of information. It needs updating in a few places but is a well done site overall if a bit minimal compared to some.